Institute" under the ownership of Professor A. W. Mell (1855-1931). When first established it was chiefly a common school, but was chartered under a board of trustees on March 9, 1876 as the "Glasgow Normal School." Mell operated the school out of the former Urania College building in Glasgow, Kentucky. In 1882, J. Tom Williams became his partner and head of the business department. When over three hundred students enrolled in the fall of 1883, Mell and Williams sought community financial support to expand their facilities. Support was not forthcoming, however, and they decided to relocate to Bowling Green when citizens there subscribed $3,000 for the move. Controversy raged through the summer of 1884 over Mell and Williams' right to move the school. Ultimately, they took most of the faculty, students and equipment with them, leaving behind only the Glasgow school building and charter. They called their new school the "Southern Normal School and Business College." J. M. Stallworth. Ruric N. Roark succeeded him in 1885, and was in turn succeeded in 1889 by F. M. Malone. J. R. Alexander and H. McD. Fletcher took over in the summer of 1890, but left after one term to join Mell and Williams in Bowling Green, effectively signalling the end of the Glasgow Normal School. 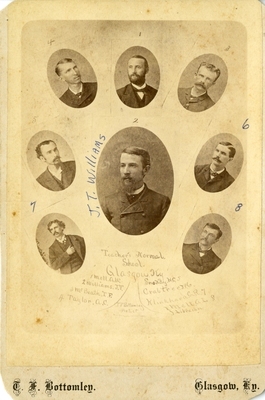 This image shows the faculty and staff: Top row l to r: A.C. Taylor, A.W. Mell and T.F. McBeath. 2nd row l to r: H.C. Snoddy, J.T. WIlliams and J.P. Crabtree. 3rd row l to r: G.R. Klinkhead and A.L. Mell.